The Byrds. Turn, Turn, Turn! LP cover. 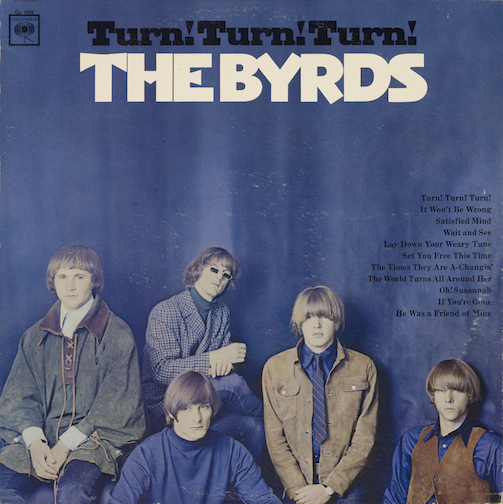 Forty-six years ago today, the Byrds released their second album, Turn! Turn! Turn! The album’s title track is a folk rock interpretation of a song Pete Seeger had written in 1956 based on Book of Ecclesiastes 3:1 as translated in the King James Bible. Seeger’s adaptation was popular among the artists of the early 60s folk scene, but when the Byrds applied their groundbreaking folk rock sound to the song, it soared to #1 on the charts in the U.S.
Over the decades, the popularity of the Byrds’ version has not only continued but the recording has become a powerful cultural landmark. The opening jangle of Roger McGuinn’s 12-string Rickenbacker is a sound that immediately evokes the turbulent times of the 1960s. The song’s concluding appeal for peace, “I swear it’s not too late” (Seeger’s original contribution to the lyrics), will be forever linked with the Vietnam War. Yet the song and its message remain somehow timeless, an unlikely collaboration spanning the centuries between the King James Bible translators, Seeger, and McGuinn. This entry was posted on December 6, 2011 by curatorsteve. It was filed under From the Curators, Influences and was tagged with Byrds, Ecclesiastes, Pete Seeger, Roger McGuinn.